NetTraffic is a network bandwidth speed monitor supporting real time data rate chart, network usage history and quota usage meter. The window can be resized, will auto-adjust to clearly display speeds, and has a variety of colors and data visualizations. How to extract: Download the "Portable" ZIP package and extract to a folder of your choice. 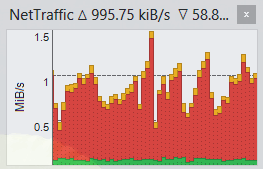 Launch NetTraffic.exe. Looks like a proper replacement for the unfortunate NetWorx. Thanks!